We empower businesses to develop online presence strategy eventually helping business growth. Video can have a big impact on your bottom line. A majority of consumers say that video has influenced their decision to buy. So try video on your site and social channels to boost sales. Consumers often want to see videos from your business before they they click through to your website. A well-placed video can entice your audience to learn more and drive traffic your way. Social video gets more shares than text and static images combined. It also encourages more views, tags, and comments, which can help you get noticed in a crowded marketplace. Our team of video experts is ready to help you grow your business online with tips, ideas, inspiration, and feedback on your videos. We turn your business storyline using digital medium with creative thinking that enables online growth by connecting with online masses. Transforming businesses with Digital Strategies. 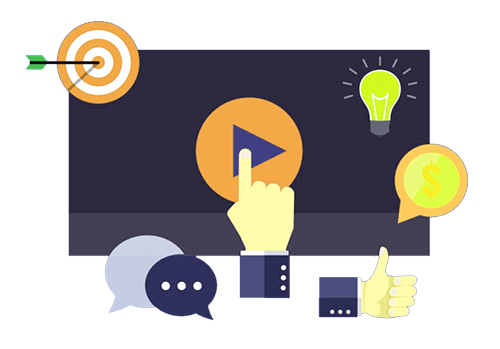 Video marketing accomplishes all the work that traditional marketing does, but it amplifies the effects. Humans are visual creatures, and we can’t help but be drawn to moving images, whether they show a cat jumping into a box or a service that a business provides. The more places your potential customers can find out about you, the better your chances of converting them into paying customers. Once you have identified and established your brand, you need to get the word out. If you aren’t using video for marketing, you’re missing out on a huge opportunity to amplify your reach and engage your audience. One of the best ways to grow your customer base is to help more people find out about who you are and what you do. Rather than getting lost in the crowd, you want your business to stand out among your competitors. With videos, you quickly convey what your core values are. You can increase exposure to potential customers by offering entertaining, educational videos that inform them about your company and help them remember your name. There are so many different marketing strategies out there, it can be difficult for small businesses to determine which ones make the most sense for them and which are going to provide the best ROI. It’s important to pay close attention to developing trends so that you’re educated on the most current methods and strategies. A somewhat new, but fast-growing tactic, video marketing provides an avenue for small businesses looking to increase sales, online presence and customer engagement. According to Syndacast, 52% of marketing professionals worldwide name video as the type of content with the best ROI. Additionally, almost 50% of internet users look for videos related to a product or service before visiting a store. As the data shows, there are many benefits to incorporating video marketing into your budget. Here are just a few of them. Educate customers on both your product and service offerings and tell your story. Engage with the mobile audience. Increase your Google search ranking. Reach a wide variety of customers. Marketing is about showing potential customers that you understand their concerns and can solve their problems. The best way to build a relationship is through face to face interaction, but this just isn’t realistic for growing a business. All the time in the world is not enough to meet every potential customer personally and earn their trust. Thankfully, you can capture that sentiment in the form of video content. Even better, it’s available 24/7. Video marketing can help your small business by building long term relationships with clients before you ever meet them. When customers see you, your team, or your product in videos, they gain more confidence in your brand. Trust is essential for every small business, and video marketing can be there when you can’t. Be Digital … If you are not already! We are an innovative, digital company that specialises in ICT Solutions. We provide services that incorporate well-defined standards and frameworks, from consultancy to the creation of digital strategies for your business. © All rights reserved | Be Digital Limited.